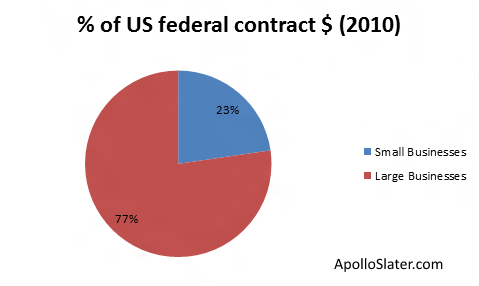 Continuing in our series on “Government as the cause of capital concentration“, let us look at how the US government supports large businesses in the way it awards federal contracts. According to the SBA, 22.7 percent of federal contract dollars were awarded to small businesses in 2010 and the rest to large and international businesses. There is strong evidence this is an overestimate of the actual share, due to improper classification of business size. Meanwhile, the SBA reports that small businesses accounted for 44.5% of GDP in 2010. That means the government awarded much more money to large businesses relative to their contribution to GDP. This is strong evidence that the government directly increases concentration of capital by supporting large businesses vs. small businesses.